A couple years ago, I supported the Beautiful Noise music documentary by HypFilms on Kickstarter for a DVD copy which I received a couple weeks ago. And while it may have taken a year longer than expected (sadly kind of becoming a norm for these types of crowd funded projects), I was very happy with the result. Looking back, my only regret is not going for the blu-ray (available for $29.95 through their online store, which can also be viewed on demand/downloaded from Vimeo for $15). 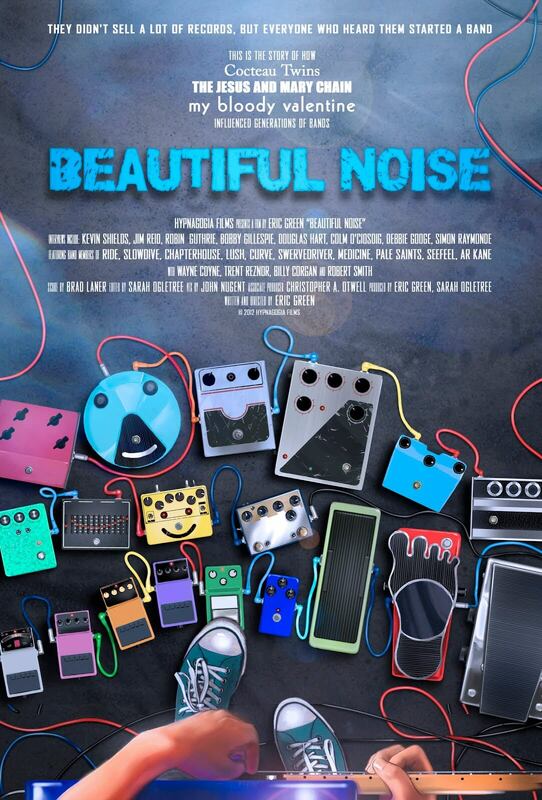 “Beautiful Noise is the first-ever documentary about one of the most influential, underground music movements of the late 20th century, a fascinating period when some innovative musicians mixed guitar noise into conventional pop song structures while maintaining a philosophy of letting the music speak for itself. Although many of the people interviewed are notoriously press shy they have opened up about their music and experiences from over 20 years ago, how they defied the rules and became sonic innovators that have inspired so many. Featuring members of Cocteau Twins, The Jesus and Mary Chain, My Bloody Valentine, Ride, Slowdive, Chapterhouse, Swervedriver, Lush, Curve, Pale Saints, Seefeel, AR Kane, and Medicine. Also featuring Wayne Coyne, Trent Reznor, Billy Corgan and Robert Smith. Throughout the film, the Cocteau Twins are referenced as the band who “critics claimed would be influencing mainstream rock” from their underground beginnings in the mid-80’s. Robin Guthrie’s guitar, Liz Frasier’s voice, and Simon Raymonde’s production of the sound are all pointed out as what made this band so influential on this movement. It eventually would influence the sounds of numerous bands that followed. You hear the influence from the sound of the bands more than they are specifically mentioned in the film, though Robin Guthrie and Simon Raymonde’s interviews are notably placed throughout. There are many interesting interviews including the The Jesus & Mary Chain‘s Jim Reid and Bobby Gillespie (who started out drumming for them before heading Primal Scream). Old clips of early interviews and concert footage are interspersed with Jim Reid’s story of how Bobby Gillespie helped them get their first gig. You get a good first hand account of the importance of their lifelong friendships keeping them going despite years of frustration in dealing with a business that relied more on sales and numbers than feelings and influence. Alan Moulder is mentioned and interviewed as the producer (and scientist) who helped Ride (and a number of other bands) sound so good on record. The interviews with well known and influential musicians who appreciated the music made by these bands include Trent Reznor, Robert Smith, and Billy Corgan. They explain how the sounds made by these bands were appreciated by and influenced bands to follow all over the world. They also kind of explain the importance of the feeling brought on by the sounds that were created, above the lyrics you couldn’t always hear or understand without a lot of listening. John Peel’s radio support is also pointed out as helping both the Cocteau Twins and the Jesus and Mary Chain gain exposure. This documentary is a must watch for those who enjoy the music made by these bands that supported each other in spite of dealing with labels that weren’t supportive enough or tried to interfere with the creative process. Kevin Shields of My Bloody Valentine describes their band’s relationship with Creation Records, lack of radio play in the US (which Billy Corgan pointed out as the most important for exposure in the 90’s that Swervedriver may have lacked. Dismissal from music press (most of the interviewees avoid using the term “shoegaze” through most of the film). Many of the bands interviewed mention they disliked interviews. This is sort of a look at the inner world of the artists themselves in their dealings with the business they didn’t necessarily enjoy working in or with. They didn’t feel as successful as they may have been from a business aspect. There are a lot of recent reunions (Slowdive, Ride, Swervedriver) and resurgence in interest in these bands. I hope this film helps these bands in gaining some recognition for the music they created and perhaps feel that their connection to the fans and the bands who were influenced by them as an important reason for their continued existence.